My weekend is Sunday-Monday, and I’ve forgotten what it’s like to have the luxury of a full weekend without work appointments. But I also haven’t had the full-time job to make my days off so stinking precious, especially when it comes to getting quality time in with the kids. And even though it looks like my standard work day, including commute, errands, and kid coordination is easily 12 hours, I can say without a doubt that a day of parenting is more exhausting than a day of work. The kids scootered to the park while Level 8 and I half ran next to them. It was a bit chaotic, and NK totally took me out. I asked Daisy what happened later, and she said NK ran into me then our dog ran around NK, getting the leash wrapped around his scooter, and somehow that meant I was completely knocked off my feet while I was yelling at Daisy to get out of the street and back on the sidewalk. Hilarious but OUCH. 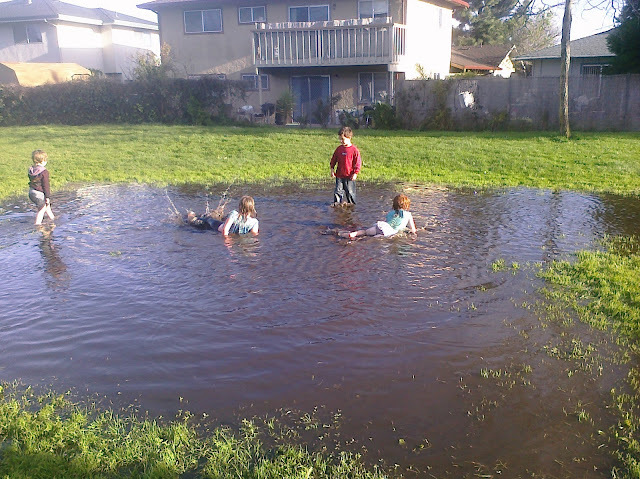 When we got to the park, there were three rather large puddles – these weren’t even puddles, they were lagoons, OK? And I was yelling at the kids to get away from them because it wasn’t a warm day. But they couldn’t stand it. They kept orbiting, closer and closer. Level 8 had no problem with her kid taking his shoes off and going in. I was smarter at first . . . no, I know what’s going to happen. One of my kids is going to fall in the puddle and get cold and have a breakdown. I was wrong – all three kids I was responsible for were getting drenched before having breakdowns. I get why Level 8 let her kid play in the puddles. 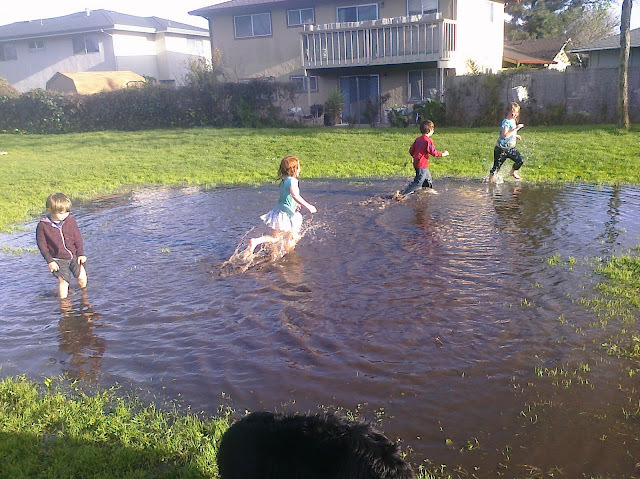 Kids are supposed to squish mud through their toes. That’s why I finally relented. And here they are. Daisy was the first to fall in the mud. She was really upset but I convinced her to stay and play at the park. I thought at that point, now that you’re acquainted with the puddle, you might as well enjoy it. 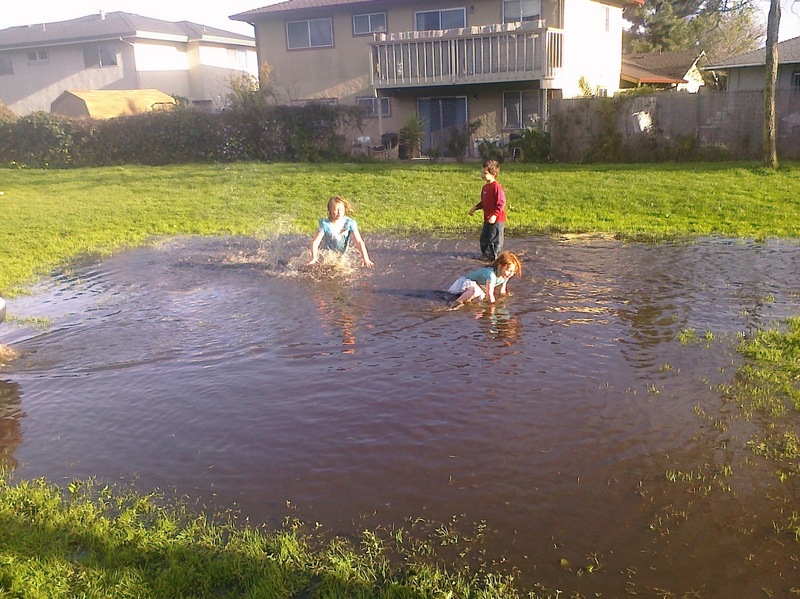 Soon, the kids were rolling around all swine-like in the mud. Then, Daisy announced she had peed her pants, and things took a dark turn. The kids were cold. Their shoes were wet, and we were a good scooter ride from home. When NK made the announcement that his mom was going to be SO MAD AT HIM, I realized I was in a bit of a situation. I had three unhappy kids trying to shed their clothes who didn’t think they could scooter, and it was only getting colder. Level 8 took full responsibility, and we worked together. She was amazing in getting Violet to walk home barefoot wearing nothing more than two sweatshirts and sopping wet underwear. I focused on getting Daisy and NK to continue their shivering, reluctant march home with scooters in hand, while I carried a pile of wet clothes, three pairs of muddy shoes, a scooter, a banana - the snack NK's mom sent with him - and hung onto the dog leash, wrists aching from breaking my fall earlier. When we got home, I apologized to NK’s mom and handed her the bruised banana, got the girls cleaned up, and beelined for warm food before laundromat. The girls happened to be wearing brand new, favorite outfits for their puddle adventure. I was a bit frazzled at the laundromat. Violet was melting down. She wanted something she calls “warm baba, warm babble,” which is lukewarm apple juice in a slightly warm cup. It probably brings her back to the breast milk days. We walked to the corner market to get drinks, and the only apple juice we could find was chilled. When we got to the front of the register line, I made the plea to the cashier . . . do you have any room temp apple juice? He took pity on us and found some in the back while the rest of the line glared and Violet sulked. By the time I was helping Daisy with her homework and replying to work emails back at the laundromat, my patience had left the building. I received dirty looks from a random lady folding her laundry, and I felt like turning around and letting her have it right after I was done letting Daisy have it . . . look, if there’s something I can’t stand, it’s snapshot judgments. I refuse to walk around judging people based on two-second assessments. I might sound like a jackass at this very moment, but it’s been a long freaking day, and I’ve given it a good college try. So take your disapproving frown and . . . I decided to smile at the stranger instead, which probably made me look insane because of how frustrated I was. As I was putting the kids to bed, Daisy apologized for it being such a rough day. I corrected her . . . no, it’s just life. We had our highs and our lows. It’s normal, nothing to worry about. I’d be so lonely and bored without you. Her reply was warm, relieved, “I really like talking to you, Mom." The stupid stress faded.